Regular readers of loudspeaker and subwoofer reviews both online and in hi-fi/video magazines are used to seeing references to the sound quality of deep bass reproduction. Adjectives such as “tight” and “flabby” or “loose” are tossed around by reviewers in quite casual fashion, as if it’s a given that subwoofers or large loudspeakers have inherent traits of “tightness” or “flabbiness” based on their design. Indeed, it’s almost become a cliché that sealed subwoofers yield “tighter” more “musical” deep bass than ported or vented subs. I’m here to politely disagree and suggest, perhaps strongly, that much of that talk of “tight” or “flabby” bass is a lot of anecdotal hot air. Assuming competently designed subwoofers (not white van “one-note subs”), I believe that all such impressions of "tight" or "flabby" bass are almost entirely the product of crossover points, room placement, listener location and room standing waves and room modes — plus the listener's active imagination. Added to this are the casual listening comparisons made of subwoofers, with no scientific controls in place. It hasn't helped that a lot of subjective reviewers in certain magazines and web sites talk about this without understanding the fundamentals of bass frequencies and room effects, or how to do careful appraisals of subwoofers. Moreover, deep bass is not intrinsically "tight." The wavelengths are long and quite slow compared to midrange and high frequencies. 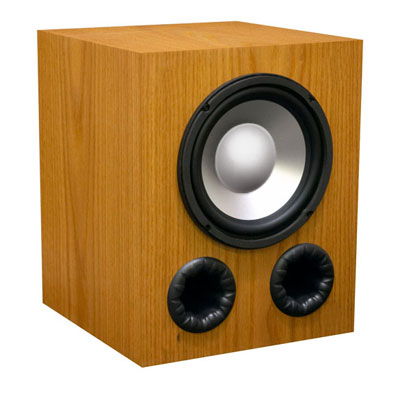 In fact, the woofer cone movement is very slow compared to upper bass and higher frequencies. But don't take my word for it - you can prove it for yourself. Try playing only your subwoofer with no accompanying upper bass and midrange frequencies. Turn off all the speakers except the sub. There's nothing "tight" or musical sounding about what issues from the subwoofer—unless of course the crossover is not engaged or there isn't a steep enough roll-off. That’s because the midrange and upper bass transients supply the “tightness”—the initial plucking of a stand-up bass string, for example. The "pluck" or snap of the string is hundreds of Hz higher than the fundamental energy, which is often in the region of 30 Hz to 100 Hz. Similarly, the initial “thwack” of an orchestral bass drum is in the lower midrange; so are the sounds of the percussionist’s mallets connecting with the stretched diaphragm of tympani drums. Another experiment you can do to understand the natural reverberance of bass is to actually try hearing a plucked or bowed double-bass viol or cello, or even an electric bass guitar, in your own room. Some reviewers I've read seem never to have had this experience. I have had the good fortune to experience it first hand: my mother led a small chamber orchestra that practiced in the music room of the house I grew up in and that included a big double bass and a cello. A good friend of mine in Toronto is a professional double bassist, and when you hear that bass plucked or bowed in a domestic room, the whole room—the entire house— is suffused with bass; it lingers and reverberates. It's wonderful and astonishingly powerful. So is a real cello played in the confines of a typical living room. Words like "tightness" or "flabbiness" simply don't apply. Try and think of subwoofers simply as low-frequency air pumps, supplying the long wavelengths of the deepest bass fundamental tones. You simply want enough power to move enough air—to fill a particular room at a level that yields a plausible illusion of the real instruments, so choose the appropriate sub that will do that, and use excellent satellite speakers, such as the M80s, M60s or even good bookshelf models like the M22s, M3s and M2s to supply the elusive “tightness” that audiophiles seem to believe exists. As long as the satellite speakers, whether floor-standing or compact bookshelf models, have smooth midrange and reasonably linear upper bass response to 100 Hz, then they’ll generate all the tightness that’s present. Of course a very powerful amp capable of properly reproducing these upper bass peaks will also add dramatically to the experience. For example, there is nothing "musical" or "unmusical" about the EP175, the EP350, EP400, EP500, or EP600. The "tight" musical qualities are supplied by the M80s or M60s; the subs just pump out the low-frequency energy. If you place the subwoofer with reasonable care, and match them well in terms of the crossover with your main speakers, any of them will supply the "tightness" and "snap" that you're searching for. (Tom Cumberland, electrical engineer): “If there is ‘tightness’ to subwoofers, it applies to the driver and amplifier combination. If the woofer is not well-controlled, it could be categorized as ‘loose.’ Since at Axiom we design and manufacture both our own amplifiers and our own woofers we have total control over all the variables."